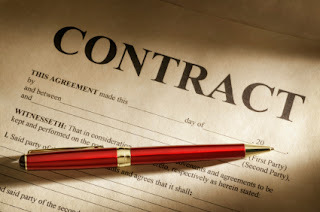 Often, professionals in a service industry fail to acquire a written service agreement that lays out the responsibility of both the vendor and the client. Because service providers have an intangible product, it is essential to formalize the understanding of services and obligations. For example, bookkeeping or accounting professionals or firms may be intrinsically involved with a client, and because they represent an infrequent service, their clients will sometimes neglect the invoices or statements received. Also, coupled with the fact that service provider clients are often limited companies, means that service professionals need to protect themselves, and clearly lay out their terms of service, typically with a letter of engagement. These letters are often found in the accounting sector, and an abridged example of such a letter is below, but it is worth any service provider to have a similar template. The key pieces of a letter of engagement are the points dealing with liability for errors, and the responsibility for each party to provide accurate information to the best of their ability. However, beyond that, this letter outlines the term of service, payment arrangements for that service, and guarantee of personal liability in the matter of an incorporated client. This letter confirms the terms of my appointment as your accountant, and it outlines the terms, nature and extent of the services I will be providing. NOTICE TO READER: On the basis of information provided by management, I have compiled the balance sheet of ABC Company as of October 22, 2013, and the statements of income and retained earnings for the year ended. I have not performed an audit or review engagement in respect of these financial statement and, accordingly, I express no assurance theron. Readers are cautioned that these statements may not be appropriate for their purposes. My engagement should not be referred to as an audit, since it will not fulfill any statutory, contractual, or other requirements, nor will it fulfill any requirements for financial statements that are prepared in accordance with Canadian generally accepted accounting principles. In view of the limited nature of my engagement, you may wish to obtain legal advice regarding any statutory or contractual requirements. The Ontario Business Corporations Act requires that the company appoint an auditor unless all shareholders annually agree to waive such appointments. Please ensure that the necessary shareholders’ resolution waiving appointment of auditors is approved annually. (c) If, during the minimal study entailed in my compilation, I learn of any matter that, in my opinion, would cause the financial statements to be misleading if not disclosed, it will be disclosed in the financial statements, or I will be required to withdraw from the engagement. (d) Each page of the financial statements will be marked “Unaudited – See Notice to Reader” and will either carry my notice to reader or refer the reader to it, and the financial statements must not be circulated without my marking and notice. (f) I will also prepare the necessary Federal and Provincial income tax returns and supporting schedules, carry out any bookkeeping that is necessary to effect the compilation, and perform such related services as may be agreed upon from time to time. (g) My fees are based on the complexity and nature of the work, and on the degree of responsibility and skill required. Any disbursements will be added to my invoice. All billings are due upon presentation, unless other arrangements have been made in advance. An interest charge of 1% per month (12.7%) on an annual basis) applies to overdue accounts. (h) The undersigned agrees as part of these engagement arrangements, to personally guarantee payment of my fees for professional services rendered on his or her behalf, should his or her business entity fail to make payment on any fee or billing issued, within thirty days of receipt of same. I confirm my duty of confidentiality with respect to client affairs. Accordingly, except for information that is in the public domain, I will not provide any third party with confidential information concerning the affairs of the Company without the Company’s prior consent, unless required to do so by legal authority, or by the Code of Ethical Principles and Rules of Conduct (CEPROC) of the Certified General Accountants Association of Ontario, or there is an exception granted under the Personal Information Protection and Electronic Documents Act (PIPEDA) of Canada. Further, in order to complete my engagement, I will require access to certain personal information. You hereby represent to me that you have obtained all consents that are required under applicable privacy legislation for the collection, use, and disclosure of personal information. The above terms will remain in effect from year to year unless amended in writing by both parties or terminated by written notice by either party. Upon termination of this agreement, I will invoice you for any unbilled fees and expenses. Further, you agree to pay your account to the date of termination upon receipt of my invoice, and the terms of billing and liability in this agreement will survive indefinitely from the date of termination. If you have questions regarding payment terms or personal guarantee phrasing in a letter of engagement, I would be happy to assist. Feel free to call me at my office number below. Our office is located in the Kitchener, Ontario area, performing both third party collections and accounts receivable management consulting. Kingston Data and Credit believes in a business partnership with our clients to assist them with our credit cycle, not just acting as a collection agency blindly working on what accounts have been assigned. Blair Wettlaufer has worked in the credit and collections field for 23 years. He has trained over 300 collection agents, registered an agency under ISO 27001, and worked with a number of companies as a partner and advisor to help them build a better business. He has also tried to treat consumers who owe debt with respect and courtesy, helping to remove themselves from collections, and better their financial situation. If you would like to contact Blair with a question you would like answered, or you would like to speak to him directly regarding a collection issue, please feel free to email him at bwettlaufer@kingstondc.com – he is always willing to share his expertise. Collections Isn't a Black Box Process - Why Aren't We Talking? Credit Bureau Or Small Claims Court? Financial Literacy - Do Your Homework! Financial Literacy - Read the Contract! More Change For Ontario Collection Laws? Paid in Full - Now What? What's Your Plan For Failure? Who Is Really Running Your Business? Working With Others I - Why Do You Work Here? Who Pays For The Tools? Credit Institue of Canda - How Long Is A Debt Good For?